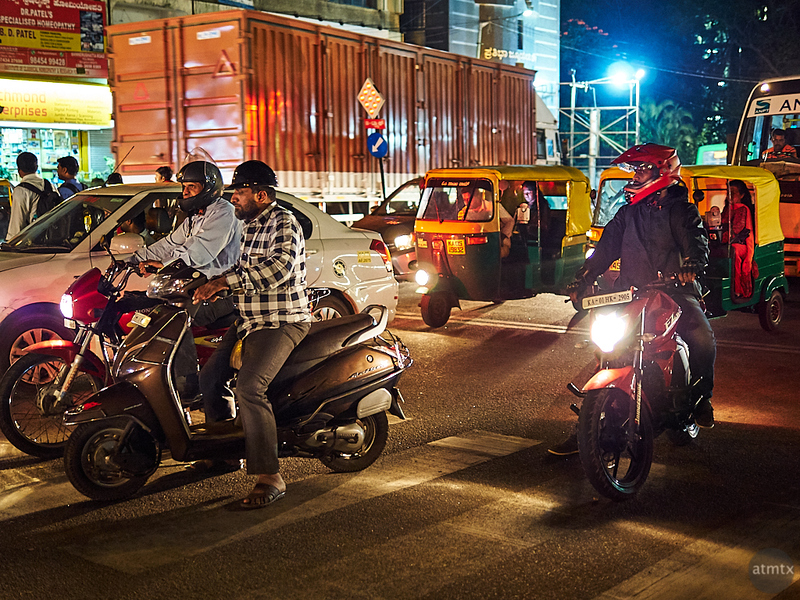 In this third and last installment of nighttime urban photographs in Bangalore, I embraced the glow of traffic. It’s another mundane photo but the mix of vehicles makes it a lot more interesting than in the United States. In Austin, at a traffic stop, you’ll find cars and mostly pickup trucks and SUVs. Probably no scooters or motorcycles and certainly not any autos, those green and yellow three-wheeled vehicles that are a favorite of mine. In retrospect, I should have shot more on the street. The photo information indicates that I was out on my walk for only 15 minutes. I don’t recall why it was so short. Perhaps I was tired at the end of the day, or the continuous sensory bombardment makes it seem like I was out longer, even when I wasn’t. India is a neat place to shoot, but the unstructured traffic makes it more challenging, even to just cross the street. You shouldn’t walk carelessly, or you might run into trouble with vehicles that seem to come from all directions. There were also shops on the other side of the street, which might have made interesting street photography subjects. But the challenge of crossing the street was too much to bear after a day of work and the increased risks of nighttime traffic.